Raynor Masterpiece steel garage doors feature 2" thick sections, a continuous thermal break between sections, and expanded polystyrene insulation bonded between two steel skins for an outstanding 10.25 R-value. Masterpiece is the only door in the Raynor Traditions Series line to feature the EnduraCote™hardware system. 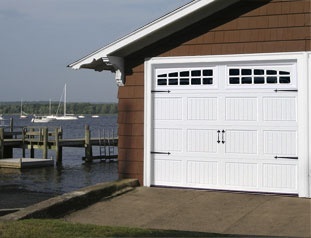 The entire Masterpiece garage door - sections and hardware - is warranted against rust for as long as the original purchaser owns their home. Masterpiece also is available with optional AccuFinish wood grain laminate finishes, or the optional ArmorFinish laminate finish.